There are many tools used today by law enforcement officers for the recovery of evidence from personal computers. Leading software applications provide the investigator with a comprehensive image of a user’s computer. 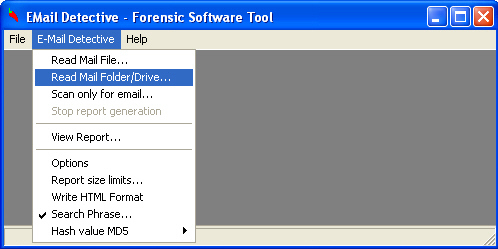 However, in the field of Computer Forensics, only Hot Pepper Technology provides a dedicated software tool that allows investigators to extract all email contents (including graphics) from America Online’s database stores on a user’s disk drive. 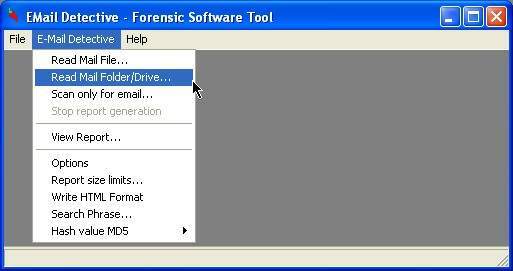 "EMail Detective - Forensic Software Tool" is used by law enforcement agencies in the U.S. and has become an invaluable tool in numerous investigations and data recovery by forensic examiners. The EMD application is an exceptionally quick and easy application to use. Within minutes, any MBOX or AOL email that has been cached or saved on a user’s disk drive is extracted, complete with all embedded pictures. Additionally, a comprehensive report is produced that contains all the emails for a user. This report can then be instantly viewed and searched for any specific words or phrases by the investigator. With a few simple keystrokes, the EMD application relieves the investigator from tedious searching through raw data dumps of a user’s disk drive when trying to view a user’s MBOX or AOL email. Client email data stores of all sizes - from 1 MB to 1 Gig or greater are easily processed. Combined with the ability to run the EMD application from a USB jump drive for field investigations. This makes EMD the best Tool on the Market for extracting Client MBOX or AOL email. EMD provides generic MBOX processing as well as client specific extraction for “The Bat”, “Claws”, “Bacra”, “Mozilla Thunderbird”, “IncrediMail”, “Opera”, “Eureka”, “Pegasus”, “Windows Live”, “Entourage”, “Mac Outlook DB”, “Zimbra”, “Microsoft MLAT Hotmail”, "Sqlite DB", "Swap file", and "PageSys". If you would like to view a demo of the EMD application, obtain the user manual or be placed in touch with existing EMD users, please fill out our product information form with your request. Chat log processing for GigaTribe, FaceBook and Yahoo is included in the Pro version of EMD. Please see chat log processing for more information - GigaTribe chat parser.